1. 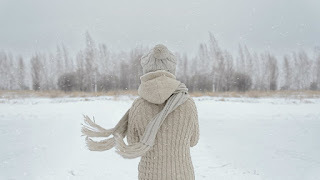 This post from Desiring God on What Grieving People Wish You Knew at Christmas. This has been a hard year for so many of us — either hte grief is new or it's simply getting a bit sharper with time. This post speaks very honestly about how holidays can be intensely bittersweet when you're grieving. Dad died over a year ago, and the first Christmas without him was one where momentum largely carried us through it. We barely stopped long enough to let ourselves think about it. This year's different. This year, we've had plenty of time for it to settle in. This year, my brother and I weren't able to come back to Illinois like we normally do, so the holiday wasn't quite so full for any of us. This year, I have friends who are mourning babies they don't get to hold, I have family mourning. We're missing something. This blog speaks well to how it feels, to what we want people to hear from us even if we can't say it out loud. How you can want to say, "I don't want to talk about it" even when you're aching for someone to understand just why you don't want to talk about it. This Christmas, to be honest, has been harder. It's harder to have a Christmas with two babies, one of whom my father was never able to meet (although I think he had his hand in her arrival, anyway). It's harder to have this Christmas without being there with my mom, my sister's family, my brother and his wonderful wife. It's harder to miss Christmas in Illinois while missing my dad. And it's comforting to read people who 100% understand what I mean by that. 2. This lovely print (and all of her other lovely prints) from Kate Whitley over at Little Things Studio. 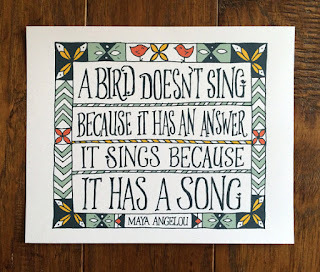 Her prints and designs are gorgeous, and the quotes that she chooses range from hymns to more secular quotes like that above. I suggest just clicking over to her shop and kind of wandering through everything. Even her abstract designs are beautiful. I ordered her 2017 Hymn Calendar as part of our Christmas present for my mom and ended up ordering one for myself as well. Just beautiful. 3. This perfect post from Tue / Night on The Season of Giving In. To be a parent is to live in abject chaos 365 days a year, and nothing gets more chaotic than the holidays. Pressure is added to buy presents and get them wrapped and prep for Santa and just do everything on top of the everything you're already doing. The post talks about the difference between "giving" everything to your children and "giving in", and how the latter is what allows you to really make the most of the moment. 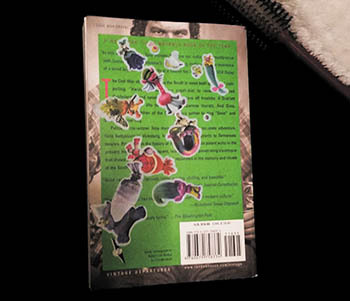 We read the phrase "giving in" as a negative one, as succumbing to something, as giving up. But to say this is the season of "giving in" is really just another way to say we'll make this the season of "saying yes". Of giving in to the moment. Of living in the right now, the way that our kids do. Seriously, the post is lovely. Go read it. 4. 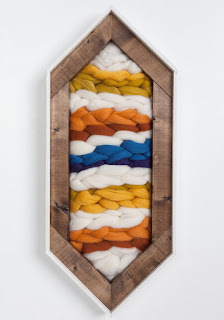 This encased wall hanging by Meredith Piper, entitled "Fall in Greenville." Meredith Piper is a local artist I just stumbled onto while scrolling the #yeahTHATgreenville hashtag on Instagram. It's the "official hashtag" of our city here in South Carolina, and I really do love just scrolling through it to see what everyone else here is up to. I ended up seeing a really pretty work Meredith had done and clicked through to her shop, to find this, which is essentially my favorite colors in one place and put together in a really interesting way. Check out her shop here on etsy, she has more traditional paintings as well. 5. To end things essentially where we began, I guess... this beautiful post from Sarah Bessey: A Prayer for the Broken-Hearted at Christmas. 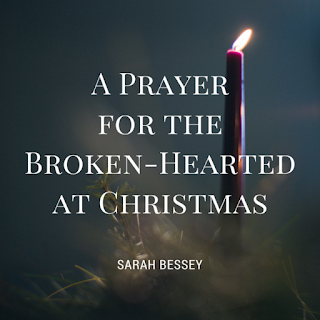 If Christmas was hard for you, whether grieving a death or a different kind of loss or hardship, Sarah Bessey's prayer is for you. Sarah's one of my favorite writers (I own both her books and I'm a pretty shameless fangirl waiting for her third), and she writes about Jesus and faith and the difficulties surrounding life as a Christian with beauty and enthuasiasm, someone who knows you can be full-hearted for God and also balk at the way Christianity tends to present itself these days. Her prayer for the broken-hearted is beautiful, and painful, and wonderful. It seems the perfect post to end with. 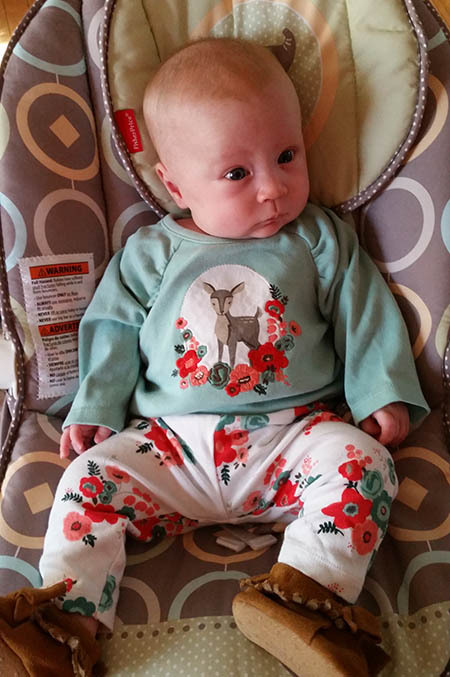 With my change in jobs between Audra and Ellie, I also changed how my maternity leave worked. With my last job, working for local government, I had access to twelve weeks unpaid FMLA. From the second I went into the hospital to have Audra until the day I went back 10ish weeks later (due to a surgery recovery the year before slightly overlapping in time), I had no paycheck. The same FMLA qualifications were true in my newest job, but with one incredible, amazing shift — my boss offered me six weeks of that leave time paid. Paid maternity leave in the United States. I can't tell you what a difference it made in how I looked at things right then and there — especially when I went into labor three weeks early and delivered Ellie before literally any aspect of our lives was 100% ready for her. I love my coworkers and I love the work I do. I have literally the best boss I have ever worked for. The idea of being away from work for twelve whole weeks simply wasn't something I even wanted to do. But I also wasn't ready to put my tiny itty bitty newborn six week old in daycare. I knew I wanted my baby to be at least three months old before she ever had to spend whole days without us. So... I went back to work from home. I've been in the office a couple of days a week, on those days that Jason is home with Ellie, but otherwise I'm scrambling to work a full-time job while performing the duties of a whole different full-time job... keeping Ellie alive. I have this whole new level of respect for stay at home moms (who are, after all, working their own full-time jobs and not getting any kind of compensation for it)... but my respect is quadrupled for women who work from home while managing children, because let me tell you — I cannot do that. I can work. I can take care of Ellie. I can take care of the house. I sure as hell can't do all three of those things. I pick Ellie and work and I let my house fall to pieces in the interim. I just am not built for a Work From Home life, and that's become increasingly obvious. Let me reassure you as well that if I'm not built for working from home, I am double-so not built for staying home. I go crazy during maternity leave. I invent ridiculous reasons to leave the house. I go to Wendy's because I just have to have a baked potato. I go to Starbucks and then just sort of drive for a while, with Ellie napping in the backseat. I watch a lot of Frasier and I watch a lot of Cheers. I go to Wendy's for a baked potato and also for chili, just to switch things up. I leave the house every weekend, sometimes with Jason and sometimes with friends, and I just go be places that aren't my house. Ellie goes into daycare next week when her spot opens up. She'll be three and a half months old, about a month younger than Audra was when she went into full-time outside-the-home daycare. I'm nervous, I won't lie — but I'm not as nervous as I was before. I know these women now, and they know me. I know how they loved Audra and nurtured her. I know how she was excited to see them in the mornings. 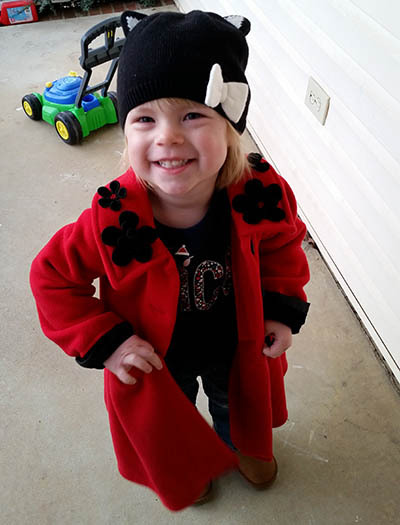 I know how she still is ready to run out the door for school and know that Ellie will get the same care and love. Will I cry when I drop her off for the first time? But I have always been a woman built for life outside my house, and I have to tell you all honestly that I cannot wait to go back to the office full time and have the two places — work and home — be separated again. I feel a lot of guilt around that, sure. I know that it's supposed to be my utter desire to be home with my babies all the time forever, but... it's just not, and it never has been. I've said before that having children was always in my life plan, right from early childhood, and that's true... but staying home with them really wasn't. After all, my mom worked full time my whole life. A working mom was the first version of a mom I knew and I built my plans around that. 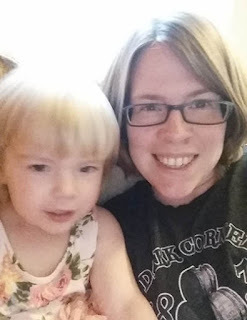 I thought about quitting to stay home while I was pregnant with Audra, I really did. If we could have afforded it, I might have given it a try. And I would probably have gone utterly insane from cabin fever by now. I do feel guilty that I don't want to stay home all day. I love the weekends, and I love holidays where we're together all day... but I also love working. I love my job. I'm terrible at doing crafts and I end up staying shy at home rather than taking the girls out to places where I might have to befriend strangers. That's the truth of motherhood, though, isn't it? Everything you do, every choice you make, is just another way to feel guilt for whatever it is you aren't doing. Especially as we increasingly insist that mothers' entire identities should revolve around their children, this gets rough. Audra and Ellie and Jason are my whole heart, it's true. But I am my whole heart, too. I drink a lot of coffee these days. 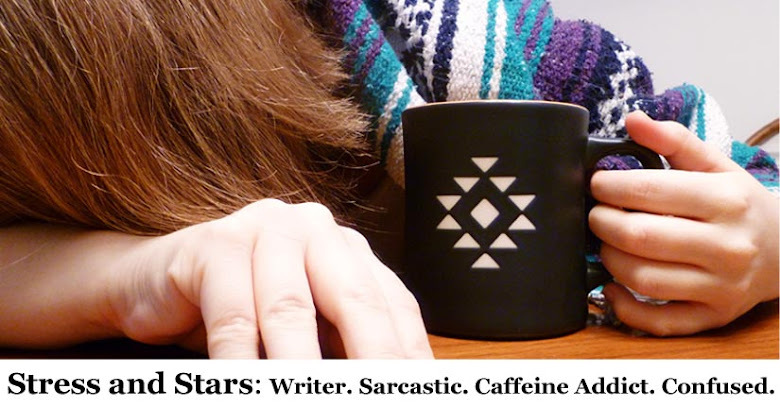 I realize that drinking coffee is an innate aspect of my personality and that everyone who reads this already knows that I drink a lot of coffee, but let me explain — I drink a lot of coffee now. At a friend's Christmas party, a friend of mine who has become a mom for the first time pretty recently asked me what it's like having two babies. I asked her if she had ever seen Jim Gaffigan's standup when his fourth was born. The sentiment is roughly the same. Imagine you're drowning, and someone hands you a baby. It's a bit less like drowning when it's two, but there are days that Jason and I, even working as a unit, struggle to keep up with the demands of two very small people, one of whom needs us to do literally everything for her and the other just really wants us to do everything for her, especially now that there is someone else competing for our attention. Add to that the simple truth that our new baby Ellie hates sleep exactly as much as her older sister did. 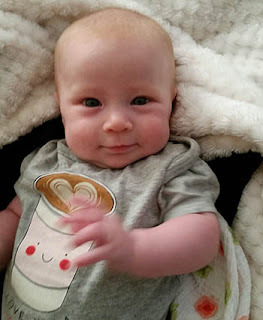 I spent the first six weeks of Ellie's life mainlining coffee. I've spent the second six weeks of her life cutting back from probably enough caffeine to damage something important to only enough caffeine that people continually remark on how much caffeine I'm drinking. I'm okay with that amount, really. That seems like a good amount. Jason and I parent as a unit and that means we share it all — we share the sleep deprivation and diaper changes, as well as the big gummy smiles and toddler tantrums. We share one of us keeping them both while the other goes to have a social life or hobbies. We share that look of mixed love and desperation when one of us returns to find the other all but hiding beneath a mound of toddler chaos, holding a cooing infant who is already head-over-heels in love with her big sister. We share the destruction we discover after turning our backs for just a second. We share nights spent watching over one child or the other. Audra never learned the art of sleeping well. 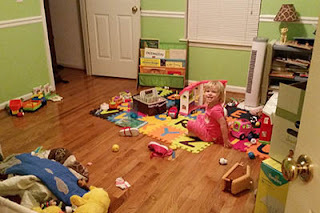 We read all the books and tried all the tricks, listened to all the well-meaning advice from loved ones, and Audra stubbornly went her own way anyway. If I can just get her to channel that bull-headed strength for good and not for making-Mommy-and-Daddy-exhausted, she could be some kind of superhero. I was worried Audra wouldn't like Ellie. I don't know much about close-in-age sibling relationships. I'm five and seven years behind my siblings respectively, and by the time I came along they had their dynamic down pat. I was worried Audra's jealousy would be an issue. Audra is jealous, to be sure, off and on.. part of her remembers when it was just the three of us still, part of her knows there didn't used to be competition for our attention. But she also kisses her little sister good night and sometimes won't even go to bed unless she gets to. Sometimes she sits next to Ellie on the couch, where we have her lying down for a nap while we sit nearby, and just watches her for a few seconds, transfixed. Her little body vibrates with all the energy she has for the day, but still, she sits like a statue watching Ellie for a few seconds. If Ellie wakes up, Audra smiles. "Ellie's eyes are open," She will announce to no one in particular, hop off the couch, and go racing off to destroy something, as is her way. One night Audra woke up and I happened to already be up with Ellie, who had just woken up wanting a bottle. The three of us sat in the dark for a while, one of my arms curled around Audra and the other holding Ellie and her bottle, just barely balanced so she could eat. "Ellie not sleep too," Audra said, snuggled into me. "Audra and Mommy and Ellie too, not sleep." I just sighed, a little bit, and tried to remember if it was 2 or 3 AM. "No," I answered. Ellie sighed contentedly from somewhere near my right elbow. "Mommy and Audra and Ellie, too," I said into the dark. "None of us are sleeping." So... I drink a lot of coffee these days. Sometimes, though, I switch things up and drink a lot of caffeinated tea. For the last two months of my pregnancy, Audra was convinced that her little sister lived in a box in the kitchen. Our friends had gifted us a present for the Baby-to-Be in August, when we threw Audra her second birthday party. 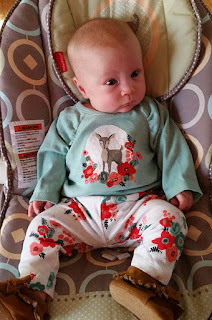 It happened to coincide with what I fully expected to be the last two months of my pregnancy (more on how that, uh, didn't exactly go according to plan later on). We had begun trying every day to explain to our toddler daughter that her little sister would be here soon, and that she lived in Mommy's belly right now until she was big and strong enough to come say hello. My friend Liz gifted us with a toy that came inside a large cardboard box. We didn't open the box, because we knew Audra would immediately claim whatever it was and it would be ever harder to give the gift to its actual recipient. Somehow, those two facts — the existence of a new cardboard box that we never opened and the existence of a baby that would soon arrive — became mixed up in Audra's mind. She became utterly convinced that Baby Ellie lived in the box in the kitchen. "Where is Mommy's baby right now?" I would ask, trying to coax her to connect with an abstract concept that I knew very well she really couldn't grasp. I just wanted to say the words, to say the name, so that not everything about this would be a scary change for a child just old enough to crave the same routine every day. Audra would consider my question quite seriously, and then nod to herself in satisfaction that she knew the answer this time. "In the box," she would say solemnly. "Baby Ellie (whose name mostly came out Baby Eh-yee) in the box." After a while, we stopped trying to correct her. When Baby Ellie did arrive, 3 weeks and one day ahead of her scheduled appearance, Audra wasn't thrilled. She did not like the squirming, crying potato in the hospital crib-bed with wheels. She did not like the unfamiliar hospital with its strange hallways that her grandparents carried her down to visit us. She definitely did not like the sight of me in the hospital bed, wearing a weird pink hospital dress and trying to explain the concept of greeting her baby sister. Ellie is nearly three months old and almost a whole year seems like I've been away from here too long. Amazingly, the day that Ellie chose to arrive, absurdly early but not dangerously so, was the first anniversary of my father's sudden death. I had scheduled a day off from my work, with my plans consisting of three things: driving to a bookstore, getting a latte, and sitting around moping about how much I missed him. Apparently, my father did not see the value in my plan. 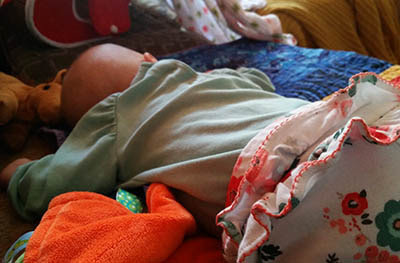 Instead of crying over his strange death on September 19th, I had a baby and wondered one more time at the strangeness of birth. Instead of moping, lattes, or bookstores — instead of my planned leisurely day of being sad — I had contractions at 3 am, a semi-frantic trip to Target before 9, and a baby before one o'clock in the afternoon. Somewhere, I heard my father's voice griping about the way the day is half-done by noon, but hey, Dad, I did what I could. All this to say, hi. 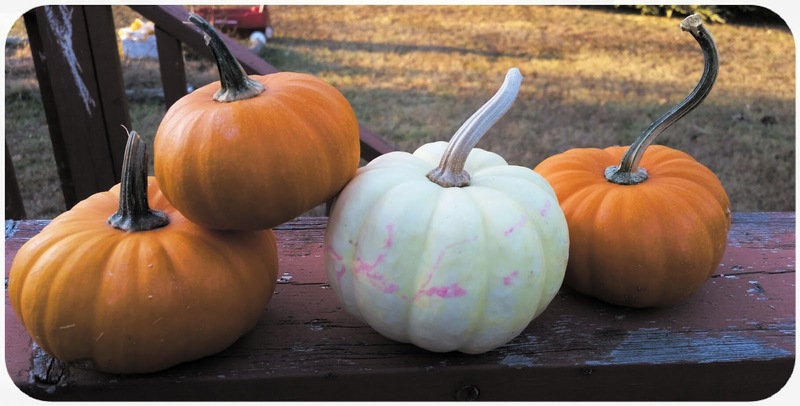 We are four pumpkins now, not three.